Getting your dream job may seem impossible right out of college. Especially when just getting a position you’re content with right out of college can seem like a massive obstacle to overcome. Before even setting your mind on going to a networking event, you should use people you already know to find people you should know. If you already have a professor who knows your skillset or a previous employer that recognizes your experience, ask them to meet for coffee and see if there is anyone you should be talking to. This will open the door for future employment opportunities, or even finding a mentor to help you in the beginning stages of branding yourself. Before going to any networking event, researching who is going to be there is vital. At a career fair, there can be hundreds of employers and often not enough time to talk to them all. Researching the event beforehand will not only allow you enough time to talk to the companies you would really love to work for, but it also shows that you care enough to be well-informed about their company. Showing that knowledge to the employer will put your name in their minds. If you’re planning on going to a networking event or even panel discussion, research the guest speakers or check Facebook event pages to see who is going. Want to talk to someone who works for a company you would want to work for? Find them on LinkedIn before the event, so you know what their role at the company is. It’s great small talk, and shows you cared enough to look them up. Print your resume out at a printing center on campus or at a local printing store. Bringing a stack of resumes printed on specialty resume or linen paper can help boost your professionalism. Your resume, printed on great paper, will stand out from others and will only cost you a few extra cents to print. When creating your resume, remember to keep it to one page per every 10 years of work experience. If you’ve been working for 10 years or less, your resume should be short, sweet, and to the point. Still need help creating a resume? Visit the University of Nevada Career Studio to get advice and a second pair of well-trained eyes to look it over for you. If you freelance on the side or are willing to take on design, photography or writing work for a company independently, you should have business cards. These cards should be well-designed if you’re in a creative field (canva.com has many great templates), and should have your name, contact info and a brief description or title that explains who you are. Business cards are small and are easy to exchange with someone. If you’re worried about your business card getting lost in their stack, try writing on the back of it after you talk to them. You can write the date, the event that you went to, or even a short little note about what you talked to them about that day. For your own memory, take their company business card and be sure to write the name of the person you talked to, the positions they have open (if any) and what you talked about. 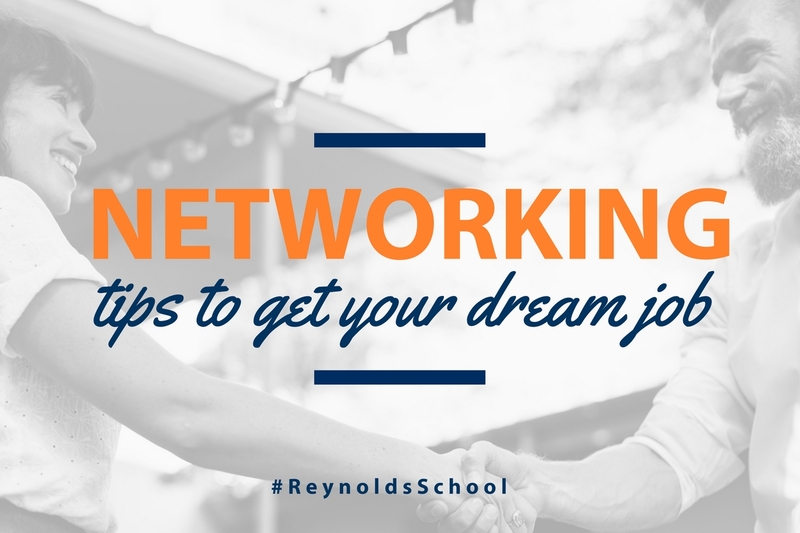 Walking in to any networking event can make your palms sweat. The pressure that you feel weighing on you should be channeled in to confident energy. The companies and professionals at networking events are there to talk to you and you’re not wasting their time. Never apologize for taking the time to talk to them, that’s what they are there for! It’s okay to ask for their advice or to ask them more about their company. Apologizing for showing an interest in working for them will only show them a lack of confidence. If you’re nervous about going alone, bring another person with you who is also looking for a position and is as interested as you. You don’t have to stick by their side the whole time, but having someone else there who is confident can boost your own level of confidence. You’ve already researched their company, so now’s your chance to prove it. Ask them questions about their company that you can’t find on their website and that you are really interested in knowing. An example could be: “I know your company has recently made the switch to go green. How did you come up with your social media campaign to promote this?” Questions that dig deep in to their company show that you’ve done your research and you care enough about them to ask interesting questions. When introducing yourself, make sure to catch their name and repeat it back to them to ensure you heard right. In conversation, make sure to use their name at least one in a response or use their name when you end the conversation and walk away. A simple “it was so nice to meet you, Marcus,” can go a long way. You’ve went to the networking event and impressed employers and professionals. How do you ensure that they don’t forget you? Follow up with them on LinkedIn or email a few days to a week later. A LinkedIn message or email should include your name, when you met them, and what you talked about. You can thank them for taking the time to talk to you and follow up with them about any open positions at their company or anything else you talked about at the event. Being nervous at career or networking events is natural, but attending often will help you calm your nerves and engage in interesting conversation. Looking to go to upcoming job fairs and test your networking skills? Last Chance Career & Internship Expo: April 19, 2018. Employers will be looking to hire undergraduate and graduate students across all academic colleges for hundreds of positions, full time and part time, both on and off campus. College of Business Spring 2018 Career Fair: March 1, 2018. This is an opportunity to meet and discuss any part-time, full-time and/or internships that these companies may have available either now or in the future.